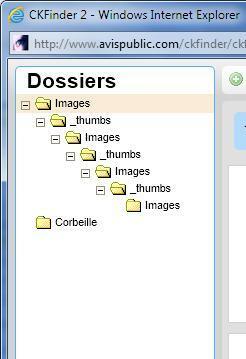 It looks like everytime I browse the server, the system adds a _Thumbs + images subdirectory to the previous one added. Screenshot attached. which version of CKFinder do you use and for what language (for PHP, asp , asp.net, java) ? Please check if you set $baseUrl and $baseDir variables correct as described here: http://docs.cksource.com/CKFinder_2.x/Developers_Guide/PHP/Configuration/Quick_Start. (this is for PHP but manual for others languages is here: http://docs.cksource.com/CKFinder_2.x/Developers_Guide). Thanks Michał! My config was a bit messy, it works perfectly now.